Prairiebreak: Mt. Ida Idyll: Kaz Daglari. A Turkish delight! Mt. Ida Idyll: Kaz Daglari. A Turkish delight! Let's not pussyfoot around: this was a highlight of a mountain bursting with gems. I've grown this wonderful woodruff for decades and to see it in the wild was fulfilling (to put it mildly). I can't really generate an epithet to describe the emotion when one sees a massive specimen like this in peak bloom in its natural habitat. One can only bless one's lucky stars. The only thing that can compare with finding an old friend in fine fettle is to make a new friend: This waif grew everywhere on top of the mountain--and I'd not even heard of it! The fabulous carpets of flowers on the heights looked as though they'd been trod by the Bronze age heroes I worshiped as a child. The amazing profusion of bright colors really does persuade one that the flowery fields must really have inspired the Persian and Turkish carpets of the Irano-Turanian kingdoms. One of the innumerable permutations of "mountain mint": Sideritis is undoubtedly the most popular herb in much of the Mediterranean--harvested by the metric ton. It's amazing there's any left. Our tour guide was a keen amateur naturalist (each carload was required to hire a tour guide for 100 lire): he spoke halting English, but thanks to Bob Beer (our intrepid interpreter) was able to share lots of stories and insights: we gradually realized these "tour guides" were along to keep the locals and other Turkish visitors from collecting herbs and other items from the Park: wild crafting is alive and well in Turkey--having a serious impact on wild populations of many plants.The Pinus nigra behind was the other focal point! I have a grudging admiration for obscure and strange families, like that of the Mignonette: I can't remember when I last stumbled on it in the wild. Few plants can be less aptly named than this galumphing giant catchfly that grew along the roads. "Compacta?" --surely they jest! 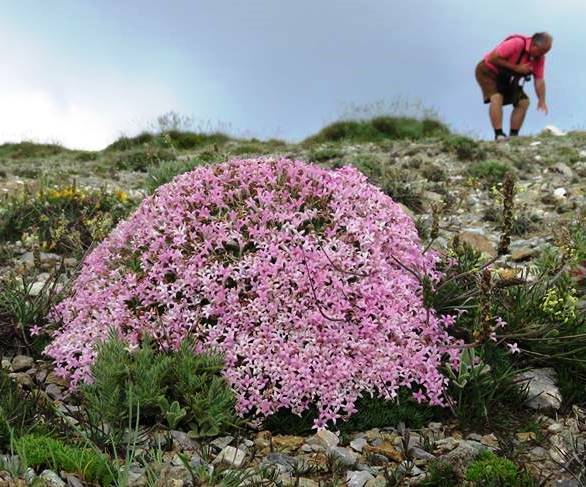 That's Liberto Dario's "scientific" name in the caption: our intrepid botanist photographing the Silene: he has produced copious species lists for every mountain we visited on our journey: all the correct names are his! The wrong ones are all my misinterpretations of which of the many Hypericum on a list is which. Three hypericums are listed for Kaz Dag: I'm quite sure I've put the write name under the right picture! Liberto identified FOUR Arenaria/Minuartia species on Kaz Dag: this one was especially fetching. Along one of the lower roads we found a moist swale that was awash with Lady's Mantle and a number of companion plants like fireweed. The color contrast was nearly blinding! It is so strange that a year ago I knew these two fellows entirely through Cyberspace! Since then, Bob has visited me in Denver twice (most recently this past week!) and we spent many magical weeks together in Turkey (and in Greece with Liberto). I feel as if they've been my friends for decades if not longer. They (like Ted Kipping in San Francisco) are what I consider B.B.C. 's (brothers by choice!). Forgive me for not labeling every slide that follows: it would take me days to do so and I'm over it--the labeling that is.. I have declared Bob Beer the President pro tem of the International Verbascum Appreciation Society (henceforward to be referred to as VAS). I am the ad hoc Secretary (and my buddy Dare Bohlander has agreed to be Treasurer in absentia). You could send dues to him, but he'd probably spend them on plants. A bit different from this little pea in cultivation, this lotus was everywhere in bicolor beauty...I've grown tired of labeling: most of the rest have been identified elswhere on this blog: just sit back and enjoy! The checklists dictate the name of this transcendent spikethrift be subsumed by this much too broad a name: I prefer the older Acantholimon trojanum. I have grown dozens of spikethrifts in my day, but few as this charming...it grew with dozens of other taxa (mostly past bloom) on the summit of the mountain along with Saxifrages and other goodies whose pictures didn't pass muster. suffice it to say...this is a heck of a mountain, well worth visiting. and re-visiting! Asperula sintenisii and me in the distance picking up my hat...and coordinating in color! Liberto gave me permission to use this picture on Facebook--so I will presume he will not mind if I re-use it on the blog (taken by Ελευθέριο Δαριώτη).. All plant enthusiasts should color coordinate with their favorite plants, I'm sure you'll agree? *Apologies to A.E. Houseman. Since he was a classicist, perhaps he won't mind the mangling. This trip was underwritten by a scholarship from the Chanticleer foundation and I was supported by Denver Botanic Gardens (absent from my workplace nearly six weeks). The focus of the trip was a comparison--florisitic, ecological and cultural--of Mt. Olympus in Greece and Ulu Dag (the Mt. Olympus of Anatolia) in Turkey. In the process of studying those two mountains, we visited many more in both Greece and Turkey which provided a valuable context. In addition to Bob and Liberto mentioned in this text, Eric Hsu--Plant recorder from Chanticleer--accompanied me for both Greek and Turkish segments, but we also spent four days in Copenhagen doing valuable research in their herbarium and botanic garden of the University of Copenhagen. Wonderful pictures and commentary, as we expected, of course! What would alpine gardening do without you, kouniade?!!! Utterly magnificent … another floral heaven to add to that ever-growing list. Many thanks, PK. Much appreciated. Amazing, incredible, wow! Thanks for sharing images of these amazing places and plants. Alas, Mr/Ms Anonymous--the camera is not to blame in this instance: it's me. I need to learn how to USE the camera. I have an aversion to reading instruction manuals. I did tweak and experiment and finally got some good ones (do check the Acantholimon). And you must learn to appreciate the not so subtle expressionism of mediocre pictures! A very special adventure and post. It sucked me right in on this rainy day in New Jersey. Stunning, stunning, stunning! Especially love the shot of the Arenaria filicaulis ssp. filicaulis - now that's a crevice garden! You must have done lots of good to have earned such a treat. For most people that would be a trip of a lifetime. I tried to grow Asperula sintensii in a pot years ago, but learned too late that plants tend to not like being in pots. Plants always do much better in gardens. Now Mt. Tahoma Nursery is no more and I cannot replace my lost plants. The Lotus corniculata is very beautiful on those mountains. Unfortunately, this species has become invasive in my state of Illinois. Efforts are occurring to prevent it from over taking our natural areas. What a fantastic place and what a range of plants. I've added a few to the wish list of alpines which might possibly have a chance of surviving my neglect. When the verbascum society gets up and running I'm in! We're in need of a Recording Secretary...better watch out! Most Turkish alpines seem to adapt well to Eastern U.S. Conditions provided drainage.Hopefully we'll both have a crack at these plants one day!